Is it legal to to drive with grill lights on in Oregon state? 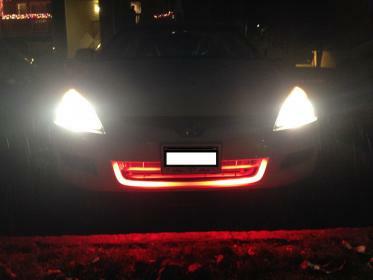 I installed a red light on the grill. I have attached a pic for ur reference. Can u please suggest how can i use it now? I thought of connecting it to the dome lights so that it switches on when I unlock the car or open the car doors and switches off when i close the door. Same like dome lights behave. How can I tap those wires? Or do u have any other suggestion? What if i use a white light instead of red? Still illegal?